Here are a couple of things I thought about that could also be interfering with the communication, and ultimately relationship, between you and your dog. Yes, the author in the story listed this as her first item, but it’s such an important item that it needs to be said again. Dogs don’t speak English, German, Japanese, Italian or any other human language. They’re associating a verbal cue with an action that has likely been shaped by positive or negative reinforcement. That’s all. Every word not associated with a cue just muddles the message for your dog. When training and competing, do your dog a favor and keep your mouth shut except to issue the commands you need. As the author in the article says, dogs mostly communicate through body language, and they’ve become masters at reading humans. When teaching new commands, you can even incorporate physical cues (such as hand or body gestures) with the verbal cue (spoken command), and eventually you will be able to remove the spoken word and communicate silently with your dog. Practice reading your dog’s body language, and practice using only body language to communicate with him and you’ll experience an entirely new level of communication and understanding with your dog. When commands are spoken, they should be short, direct and consistent. The same word, given in the same tone at the same time with the same level of commitment and expectations is key. If you waver in your commitment to giving a command (in essence, asking the dog if it would like to comply), change the cue word or use varying tones of voice, the dog is left too many variables to process and that will come through in its performance – either through lack of effort (if you give an inch, a dog will take a mile) or out of confusion (not knowing if you really mean sit when you timidly ask ‘sit?’ instead of speaking a crisp, clean ‘sit!’). Be consistent with all aspects of your commands and expectations and your dog will respond accordingly. Praise is very important when teaching a command/behavior and in training (more to come on that), but over-excited praise can be counterproductive to learning and focus. Just as a hyped-up child has a hard time concentrating, an overstimulated dog does, too. Jumping around and aggressive petting combined with excited, high-pitched verbal praise can ramp a dog up and get it moving around physically while taking its mind off the task/lesson at hand. It’s highly dependent upon what you’re actually training for, as well as the individual dog’s personality, but for the most part, calm praise that communicates your pleasure with the dog’s effort is all that’s required. Keeping your dog focused will speed up his comprehension and retention of training concepts. When you’re teaching a behavior, it’s great to give ample praise – verbal, physical, food or toy rewards all work to help shape the dog’s behavior quickly and without much pressure. But after learning the behavior thoroughly, praising your dog for every little thing it does will devalue the reward. After teaching, save your praise and mete it out when deserved; when the dog’s effort warrants it or it’s required to relieve the stress of training. Try linking known behaviors that were once praised individually, together so the dog has to do more and more to earn your praise. 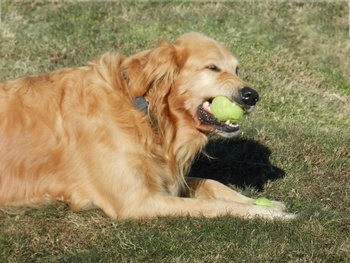 For example, instead of praising your dog for picking up a ball, and then praising for it starting to return to you, and then when it sits next to you and finally when it relinquishes the ball, withhold the praise for the first two actions, and eventually, only give it after the final action was completed. Withholding praise can make the dog’s learning just as difficult as losing focus – they don’t know if the behavior they’re performing is the correct one, the one that pleases you, if you don’t give them feedback. Likewise, during especially arduous tasks or boring drills, praise can keep your dog’s spirits up, keep his attitude positive and his work ethic and effort at a high level. It’s a fine line to walk, but learning to read your dog’s body language and understanding when he’s trying will give you a better idea of when or when not to administer praise. The biggest obstacle your dog faces in learning a new task, retaining it and carrying it out in the future isn’t just too much talking, giving too much or too little praise or any of the other things that can impede learning, but rather it’s usually poor timing when implementing all of those things. When your timing with praise or correction is off by even seconds, your dog has a harder time understanding what he’s being praised or corrected for – which makes reinforcing that behavior or changing it that much harder. Usually, even with bad timing, the dog figures it out by trial and error (which just exemplifies their intelligence and forgiveness), but it’s so much easier for them to understand if your timing is correct. Try to administer praise and corrections within two or three seconds of an action/behavior (desired or undesired); every second after that timeframe makes it harder for the dog to association what exactly you’re trying to change or reinforce. When, by reading your dog’s body language, you can see the proper or improper behavior about to take place, you can give the proper response almost instantaneously (or even help the dog avoid a mistake and be successful). At that point, you’re getting on the same page with your dog and working as a team, and that’s when the real fun begins!